Kareem Shaw is the fourth chef to take charge of the kitchens at the hip Shangri-la Hotel in Santa Monica, and he has completely revamped the menu in the restaurant, moving from Mexican style cuisine to a more international theme. He has the benefit of a robust Farmers market just round the corner from the hotel, and his cooking can loosely be described as very colorful and full of flavor. The presentation is excellent and he works closely with the new food and beverage director to pair the food with exciting cocktail combinations like the cucumber and basil martini served with Grey Goose, lemon and lime juice and of course the obligatory St.Germain elderberry liqueur. Kareem started out as a dishwasher 15 years ago and looks like he has a bright future in the local culinary scene. Born in Pasadena, he majored in culinary arts at North Michigan University. His first executive chef gig started at the “New York Deli” in Michigan which won numerous awards for its soups and pasta. Moving on to the “Wild Rover” in Wisconsin where he became a local TV chef personality, cooking one day for President Obama. On his return to California he was Chef de Cuisine at the Langham Hotel in Pasadena and Executive Chef at Frame 128. He has brought his own team into the kitchen and here are just some of the delights you can probably expect on a visit to The Dining Room at the Iconic Shangri-la. The Butter nut squash ravioli ($12) is a good way to start the meal and this succulent goodie is served with pecans and parmesan and with a touch of sage. Also the Beet Salad ($13) comes in stack form and when served with heirloom tomatoes and drenched in a balsamic reduction, I guarantee that this dish does not stay very long on the plate. 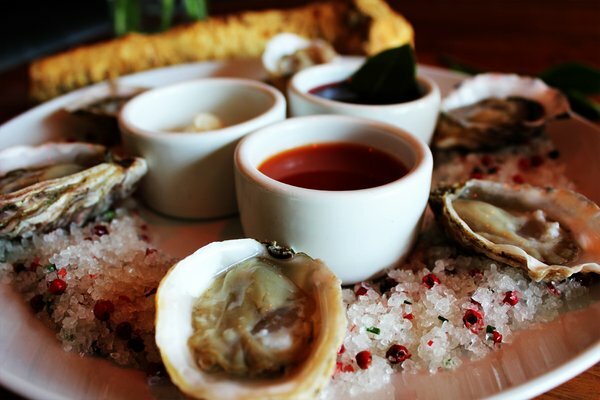 Fresh oysters are $18 for the half dozen and are served with scallions, shallots, chives, cayenne pepper sauce, jalapeno aioli and lemons and of course the perfect pairing for this dish is a crisp New Zealand Sauvignon Blanc. If there are a few of you, then a dozen oysters will be $29. Next up the chef came up with a nice chilled sorbet for the palate, a common occurrence in Europe but not so common regrettably in California. The main course for me was an unforgettable Chilean Sea Bass ($34), light to the touch and served with some of my favorite vegetables, turnips, beets and carrots and adorned with a superb mango glaze. My guest had the Filet Mignon ($36) and was raving about it the next day and chef Kareem’s version is served with mashed potatoes, spinach, wild mushrooms and a potent cognac cream sauce. Other main courses on the overtly conservative menu include Kurobuta Pork Chops ($32), Wild Atlantic King Salmon ($30) and New York Steak ($29. He clearly is testing the water and playing it safe a bit with his first menu at the Shangri-la, but moving forward I expect some pretty exciting stuff to be happening over there.